On Saturday night, Jay-Z will perform the last of an eight-day concert series at the new Barclays Center in Brooklyn, N.Y., and fans can catch the show online. The minority owner of the borough's Nets basketball team, which now calls the stadium home, began the series on Sept. 28 and plans to close by streaming this evening's show via his Life + Times YouTube channel, reports the Daily News. Beyoncé, Rihanna, Chris Brown and Magic Johnson are just some of the stars who popped up in the audience this week. Jay-Z even shared the stage with hometown hero Big Daddy Kane along with a tribute to the late Notorious B.I.G. during his performance. The hip-hop icon's Saturday show will be streamed on his new YouTube channel at 9:30 p.m.
Jay-Z's Life and Times channel is one of dozens of online "channels" offering original content that YouTube is planning on rolling out in coming months. 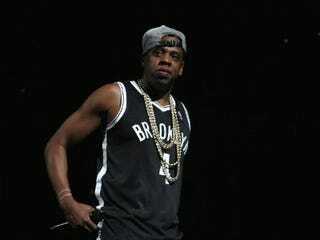 Jay-Z's promises a lineup of "in-depth lifestyle pieces" based on Hova's tastes and interests.